Over 35 year’s experience in accounting, tax consulting services and preparation of small business, individual, fiduciary, estate, trust and not for profit tax returns. Peer reviewed under the AICPA for audited, reviewed and compiled financial statements. 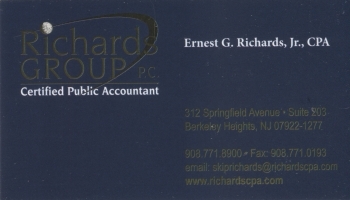 "We help solve your tax, accounting and financial problems"
At Richards Group, PC, CPA's, these are more than just the latest customer service buzzwords. They're a commitment—the guiding principles our team members follow each and every day as we work with you toward a successful future. Please give us a call or drop us an email for more information about our firm and the services we offer, or to make suggestions for what you'd like to see on our website. We look forward to talking with you soon!